Haryana Staff Selection Commission publishes the notification of HSSC TGT Recruitment 2019. View the Haryana 778 TGT Sanskrit Vacancy notice to know the eligibility and important dates. Although the notice is given on 17th Jan 2019 the HSSC TGT Online Formin in www.hssc.gov.in will open on 22nd Feb 2019. Postulants who are having the eligibilities as per the requirements of Haryana Sanskrit Teacher Recruitment can apply Online @www.hssc.gov.in. HSSC TGT Recruitment 2019 registration closing date is 25th March 2019. Job securing chance has came for the candidates in the name of Haryana TGT Sanskrit Recruitment 2019. This recruitment is the very recent one providing the jobs to 778 candidates. That means the total posts that are filling by conducting the HSSC TGT Selection Process are 778. On seeing the HSSC TGT Recruitment 2019 advertisement only candidates will recognize that this recruitment is for the B.Ed or B.EI. Ed. graduation in Sanskrit subject finished postulants. Yes, your observation is true. For a more detailed matter of the educational qualifications and age limit necessary for the applicants of Haryana TGT Sanskrit Recruitment, you have to refer to this entire page. 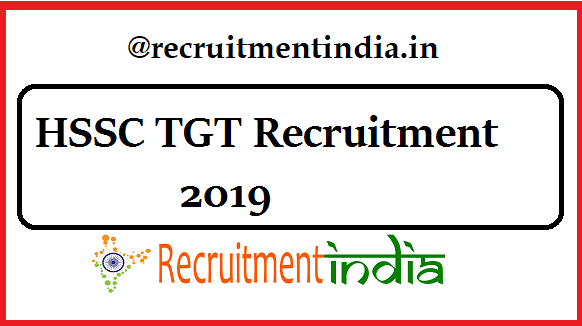 HSSC TGT Recruitment 2019 specifications that are to monitored by the ones who are very interested to engage in this selection process was explained ones. Never go to the step of HSSC TGT Application filing process unless checking the eligibility norms. Otherwise, if you did the submission of application by thinking that you are eligible in all aspects then your application gets rejected in the time of verification of details. So we are initiating the candidates that Haryana TGT Sanskrit Teacher Recruitment registration is beginning on 22nd Feb 2019. More than 1 month before the registration link activation the HSSC hinted the 778 TGT Sanskrit vacancy filling process to the candidates. So they have to use it in the right manner to taste the success at any cost. The expecting educational qualifications from the candidates who are applying the HSSC TGT Sanskrit Recruitment is at least 50% marks in Sanskrit as an elective subject and 2- year Diploma in Elementary Education or 1-year Bachelor in Education (B.Ed) (OR) Senior Secondary (or its equivalent) with at least 50% marks and 4 year Bachelor in Elementary Education (B.EI. Ed. )/ 4 year BA Ed. After taking the Haryana TGT applications, the HSSC conduct the following selection rounds to choose the best contenders. A huge number of TGT Vacancy are released through the Latest HSSC TGT notification. Only academic qualifications and age limit rules applicable candidates have to submit the HSSC TGT Application Form. They must the application fees that are fixed by the HSSC board. Haryana Staff Selection Commission (HSSC) has the opinion of occupying the 778 Sanskrit Teacher Vacancy with the truly talented candidates. Not only talent the candidates should possess the educational qualification and age limit that is exactly mentioned in the latest HSSC Teacher Notification. To find the HSSC released employment notification candidates have to go to the official site or in the short cut, they can obtain that Haryana 778 TGT Sanskrit Notification at our page. For the opening of the application form, contenders have the time till the date of 22nd Feb 2019. In the meantime, the first and foremost thing to be done by the competitors is to see the entire section of the eligibility criteria one by one. Seeing how the selection process will go on is useful to plan the reading of HSSC TGT Syllabus preparation. Therefore check it. By the time of HSSC TGT Online Form, you have to full pledged with all the details and almost engage in the preparation by collecting the study material. Get your reading study material on our site. Thus in this way postulants after fulfilling the HSSC TGT requirements go and apply online for Haryana 778 TGT Vacancy @www.hssc.gov.in Application taking process will start on 22nd Feb and will continue till 25th March 2019. HSSC panel gives takes this much time to release the HSSC Sanskrit Teacher Application Form afer the notification release is because of the registered ones. To get the clear idea of HSSC TGT Recruitment full details sometime is allocated to them. The post HSSC TGT Recruitment 2019 | 778 TGT Sanskrit Vacancy | Apply Online @www.hssc.gov.in appeared first on Recruitment India.